We published this travelogue by Fred Pirkey several months ago. We are heartbroken to say our dear friend Fred passed away last week, leaving a void in our hearts. Fred was an inspiration and true friend. He helped build the tremendously innovative New York City salon, Salon Ishi. He was also an incredibly talented interior and lighting designer. His passion for all things beautiful was rivaled only by his love for life and everyone that was part of his. India held a special place in Fred’s heart, so in tribute, we wanted to share again Fred’s India with you. My latest trip to India was to show a dear friend the India I love. The palaces and forts of Rajasthan are Romantic India. Once kingdoms, these forts are now surrounded by towns that time seems to have forgotten. They are changing, but there is an ancient feel; the stone construction is built to last. The local stone in some cities has a unique color that gives the cities their names: Jaipur, The Pink City, Udaipur, The White City, Jaisalmer, The Golden City. Jodhpur is The Blue City, but it gets it’s name from the indigo blue that is added to the paint of the Brahman, the homes belonging to the priest class. From the fort looking down on the city it appears to be endless shades of blue. I arrived in New Delhi and went to the travel agent I always use. He arranged for car, driver, trains, planes, hotels and planned the best route to see 9 cities in 21 days. The first 15 days were with a car & driver. It’s important to interview drivers – they make the trip. Ours was great; he did much more than drive us. He knew the cities very well and brought us to important sights. A tip: there is a commission system in India, so any store someone takes you to gives him/her a commission on what you buy. It’s hard to work out great prices because of this. When you really want to shop, go out on your own. Jaipur was our first stop – The Pink City. The old section is painted in a terra cotta color with details drawn on the walls in a lavender color. Jaipur is known for jewels and handicrafts. It has several large forts, a lake palace and a city palace. You can get to the Amber Fort, the largest of the forts, either by car or elephant. It’s a grand palace with gardens and water elements. The meeting places are tiled with mirror in very intricate patterns. Jodhpur is The Blue City. The stone there is brown and is carved into a lacework that covers the windows. This was done to allow the women to see what is going on without being seen. It sits on top of a big hill and from there you can look down on the city that is painted shades of indigo blue. Jodhpur is known for shoes and antiques. There are antiques, but most of what you see are reproductions or reworked wooden pieces into what the current market would be interested, like TV cabinets. The festival of color, Holi, kept us in our hotel; people throw colored powders on each other. Jaisalmer is The Gold City. Gold stone glistening in the sun, the city fort sits on top of a big hill. It’s far out in the desert and you pass many camel farms along the way. 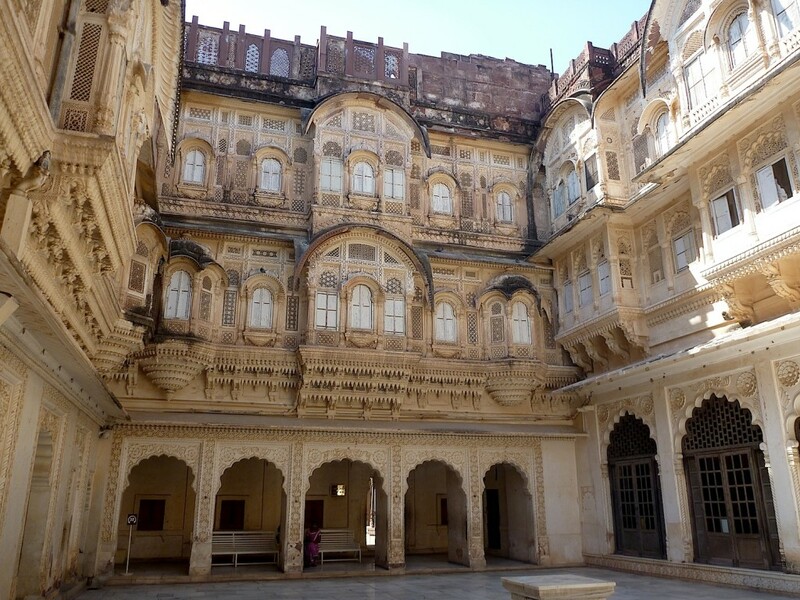 It was a trade route, so there are lavish havelis (merchants homes) with intricate carvings on every surface. About 5000 people still live within the fort. It gets extremely hot, so go at cooler times of the year. Udaipur, my favorite city in Rajasthan, is The White City. It has a large, wonderful city palace, forts in the hills for hunting and is known for it’s lake palace. There are several lakes, so it doesn’t have the same desert feeling. The current king here is very active and has made hotels within the palaces. You arrive via barge, and can easily walk this city. It has great shopping, especially gold. Pushkar is a holy city. There is a tank and a small pond where priests dole out blessings. It’s completely vegetarian. It’s sort of a hippy town with lots of Israeli tourists who go there to party. There isn’t a fort or palace and the shopping is limited. I’ve been there 3 times and have never really related to it. It does have some nice hotels with gardens, though, so it can be a break. Agra – the city of the Taj Mahal. The city itself is a mess but the Taj Mahal and Red Fort are like nowhere else. The Taj is a mausoleum for the King’s favorite wife. It’s covered in white marble with details inlaid with precious and semiprecious stones. It’s been taken over by the World Heritage so the gardens are well maintained. We missed our train to the next city so we spent the next day visiting less well known places in Agra. The best is The Tomb of Itimad-ud-Daulah better known to locals as The Baby Taj. It was built prior to the construction of the Taj Mahal and was the precusor for the inlay work found at the world famous monument. Wow! What a gem! Missing the train turned out to be one of our best days in India. When we arrived in Agra it was raining and we weren’t feeling our best. I’d met a taxi guy while trying to find a hotel for the night. He came early the next morning to take me to purchase train tickets and offered to take us around. We’d passed Fatehpur Sikri without enough time to see it so here was our opportunity to go. Fatehpur Sikri was built and later abandoned due to lack of water. It is spectacular! The king had 3 wives: a Hindu, Christian and Muslim. Each had her own pavilion and kitchen to prepare the different food styles. There are so many interesting architectural elements here. It’s built of red sand stone. We made our midnight sleeper train to Khajuraho. I’d never traveled by sleeper train before and the experience is what I imagine prison might be like. Small compartments with fold down beds, 3 on each side and 2 beds along the walkway. The beds are so close together that you can’t sit up. You slide in headfirst and arrange your belongings so you can keep an eye on them. The conductor throws you a pillow and sheets and everyone goes to sleep. Khajuraho isn’t a usual destination. It’s a very small city that is famous for its 1000 year old Hindu temples. Like many other temple or cave cities the temples were carved by priests. Daily life, the gods and kama sutra are the subject of the carvings that completely cover the structures, inside and out. There is no other reason to go here, but it’s worth seeing. The temples are spread out around the city but the best is a large group right in the city. We took another night train and arrived in the holiest city, Varanasi. 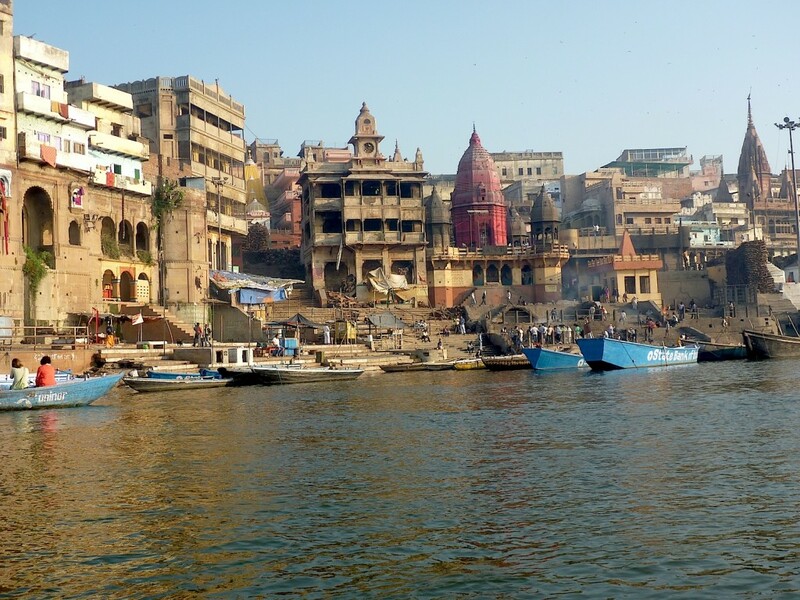 The kings built palaces along the Ganges River so that if they died there they would go straight to heaven. At sunrise you can take a boat out on the river. As the city wakes, you see everything possible along the steps that line the river: people bathing, washing clothes, pilgrims praying, the burning of the dead – all next to each other. It’s very clean compared to 20 years ago. Cows are holy and some of the most beautiful cows are well cared for here. An essential oil producer had gorgeous cows living in the rooms of the first floor of his home right in the oldest part of the city. The alley ways are very narrow so you have to navigate around the cows. There is also a large Muslim community here that is famous for their silk weaving. Back to New Delhi. As India is being globalized Delhi is impacted the most. It was not built for the amount of cars that there are now. People are leaving the countryside to work in the foreign communication businesses. Entire modern cities outside Delhi have been built to accommodate this industry. It’s taking its toll on India…the country is losing its culture. The young are all dressed in western style clothing. The color that made India famous is disappearing. The crafts that were done for generations have stopped being made as the young look for work in the cities. Delhi has all the western brands in Connaught Place, a circular series of buildings that remind you of the Raj era, when the British were in power. India is still my favorite place to go, even though it’s changing so fast that parts are barely recognizable. For anyone interested in seeing India, I’d say go there fast. There is still some of the ancient India remaining, but another generation or two and it will be gone. I am devastating and shock by his passing. Fred did also my wonderful Spa 19 years ago. Before designing a space it was always important for him to connect and reflect the future owner. People were essesntial for him. Thank you Fred for all the treasures of knowledge that patiently you passed to all of us. I respected you, admired you and love you so dearly. I pray for your soul, I ‘ve been talking to you through the stars, in the ocean and to those plants that may love. So beautiful, Yasmine — thank you.